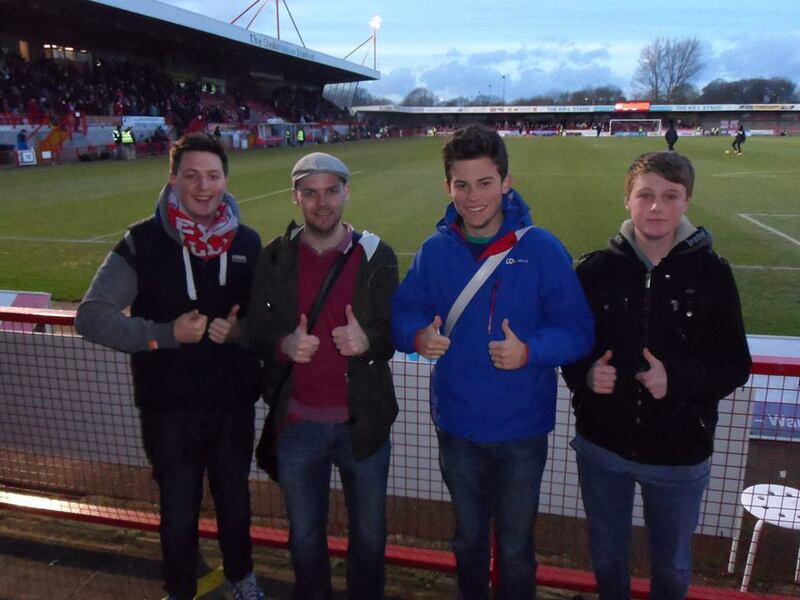 On Saturday 10th January, CTSA Member and Crawley Town ST holder, Craig Bratt met up with some of his mates he’d made through Twitter, who enjoy travelling to different grounds and blogging about it. It coincided with, what was arguably, one of the best days at the Checkatrade.com Stadium for a long time! Not only was it written about in the “Lostboyos” blog but, remarkably, a fantastic video was made of the great atmosphere and Matt Harrold making a brilliant effort in goal – events which normally would have only been seen by those fans who were there! Below, Craig tells us about the Groundhoppers, his day with them and a day Matt Harrold will never forget……. Ben, Matt, Jack and Ellis give the “thumbs up”…..
At Saturday’s game against MK Dons, I was joined by Matt Harrison – a Swansea City fanatic. To understand why, I’ll take you back to early 2014 and our trip to Meadow Lane, Notts County. I’d first come across Matt on Twitter. Matt (@mophead_88 if you want to follow him) runs a blog called ‘LostBoyos’ and co-presents a Swansea City podcast named ‘JackCast’. Lostboyos follows his footballing adventures around the country as he writes about his day with everything from the journey, random acquaintances, the ground, the game and not forgetting his trademark ‘thumbs up’ photograph wherever he goes and that week I had noticed he was off to Notts County. It was at a pub where I intended to meet my Notts County supporting mate, Dan, that I met the man himself, handing me a 2010 Swansea shirt for my collection and ever since I’d been hounding him to take LostBoyos to deepest West Sussex. It was last week Matt informed me he’d finally given in and booked a train to Crawley. At 11am on Saturday I met up with Matt at Crawley Station and showed him the delights that Crawley had to offer, after all, Matt doesn’t just write about the game! Pub 1, the Imperial Oak – Matt informed me he loved a Wetherspoons and swiftly took a picture (with thumbs up!). Pub 2, The Brewery Shades and Pub 3, the New Moon, where Matt enjoyed his umpteenth pint of the day and spoke to some of our fans. He was surprised to hear one of them used to play for Swansea back in the 70’s. Not even I knew that! Eventually, after watching the Welshman guzzle down another pint I took him to the ground, where, surprise surprise, to The Redz Bar he went (after more ‘thumbs up’ photos). It was here Matt informed me that the thumbs up originated after his visit, and resulting blog, which angered West Brom fans (I love that!) and it stuck. He then told me we were soon to be in the presence of his friend and Norwich City blogger, Jack Reeve (@TalkNorwichCity) and Jack’s two friends Ellis (@AwayDaysYT) and Ben. Jack runs a Norwich City based YouTube account and blog, whilst Ellis travels the country just like Matt, making a video blog of his day out. Jack’s comments before the game about Crawley being the worst side at Carrow Road this season were swiftly brushed aside; I quickly brought up Huddersfield and Millwall’s recent 5-0 and 6-1 drubbings there recently, to make my point. Ellis, with his trusty video camera in hand all game, made a fantastic video of what is one of the most bizarre games I think any of us had seen. It was certainly a good game for the boys to pick! With Brian Jensen’s injury forcing him off, into the limelight stepped striker Matt Harrold (now known as the Ginger Manuel Neuer) for one of the best goalkeeping displays by an outfield player I’ve ever watched. With the atmosphere, the crazy goalkeeping situation and 96th minute equaliser all caught on camera, Ellis’ video gave Crawley Town and its supporters some very enjoyable viewing. We’ll ignore the comment about the town itself, lads! After the game, with my glum look of despair still sitting prominently on my face I was delighted to hear that Matt thought the day was ‘by far the most exciting game I’ve seen this season’ – his words exactly. He also told me he’ll be very surprised if his visit didn’t win one of his coveted End of Season ‘LostBoyos Award’. As for Jack, Ellis and Ben, the video sums up their views exactly. You can view the Ellis’ video, as well as Matt’s ‘Lost In…Crawley’ blog via the links below. We think you’ll enjoy both!